Martin Audio took the opportunity of the prolight+sound show 2009 in Frankfurt, Germany, to introduce its new management team on the stand of distributors Atlantic Audio. Taking over the reins from David Bissett-Powell, new managing director Anthony Taylor (formerly the company’s Finance Director) paid tribute to the legacy of the previous management, which has laid a firm foundation for future successes. R&D Director Jason Baird backed this up by hinting at groundbreaking technologies presently under development while newly-appointed Director of Sales, Simon Bull, also sounded an upbeat note, having received enormous support from the company’s global distributors. 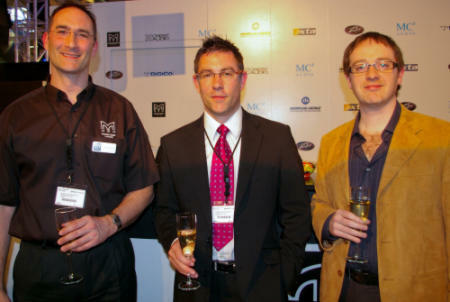 Pictured celebrating (left to right) are Simon Bull, Anthony Taylor and Jason Baird.